Order Code / SKU: 1.1XF-CE/10PK Category: XLR to XLR Leads. Tags: 3 Pin XLR, High Quality XLR, Microphone Cable, XLR, XLR 3 Pin, XLR F, XLR Female. 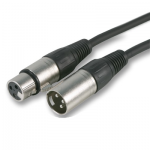 Here we’re selling a pack of 10 1.1 metre XLR 3 pin female connectors to cut/bare ends on high quality black microphone cable. 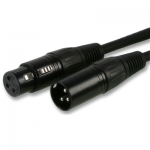 These are perfect if you want to custom make your own XLR to XLR leads, XLR to Jack (6.35mm) along with other connectors or for just hard wiring into your equipment. Or just want something to practice your soldering skills on? Then these are ideal! We’re selling these at a discounted price as these are “off cuts” from one of our bulk manufacturing jobs. Go one grab a bargain.